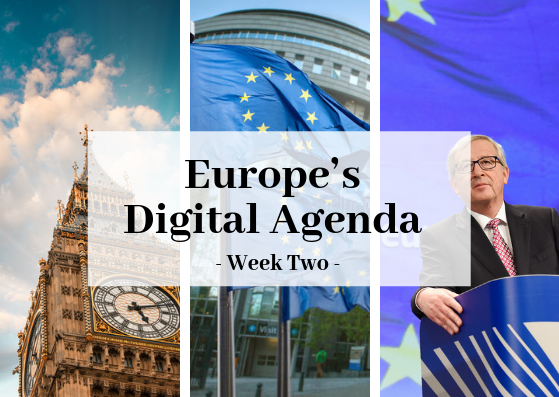 Welcome to this edition of Europe’s Digital Agenda weekly summary. In this space I will try to uncover and detail the last week’s European digital agenda, highlighting the most relevant news as well as EU institutions’ forthcoming activities, digital movers and shakers and AI funding opportunities. Last week, in this new feature, we discussed the European Investment Bank awarding a £450m grant to Nokia for 5G development, while there was also a £54m tender from the Norwegian National Civil Protection Administration, which included artificial intelligence (AI) for guardianship cases. This week, there is a similarly busy European Digital Agenda, including key developments around 5G, AI (again), cybersecurity, and GDPR. Without any doubt cybersecurity was at the centre of the EU agenda last week with Julian King, European Commissioner for the Security Union, outlining his plans to develop an EU Cybersecurity Agency, and the Commission issuing a call for proposals under the Connecting Europe Facility (CEF) to reinforce the EU’s cybersecurity capacity, with up to £11.6m available in grant funding. Following the conclusion of the EU-Japan talks on personal data protection in July, the European Commission has this week launched a procedure for the adoption of its adequacy decision. This mutual adequacy arrangement is expected to create the “world’s largest area of safe transfers of data based on a high level of protection for personal data”. On the other side of the Channel the German network agency Bundesnetzagentur outlined in a document the details of the auction for the 5G spectrum licences planned for early 2019. According to the document, operators will not be required to cover all of German territory nor to allow national roaming when they roll-out 5G services. On the ‘Brexit Corner’ the negotiations appear to have stalled with the Commission warning member countries against attending bilateral meetings on Brexit put on by the British government, and reports coming out saying that Michel Barnier had weighed into Theresa May’s Chequers proposal. The news on Brexit, of course, can change daily! 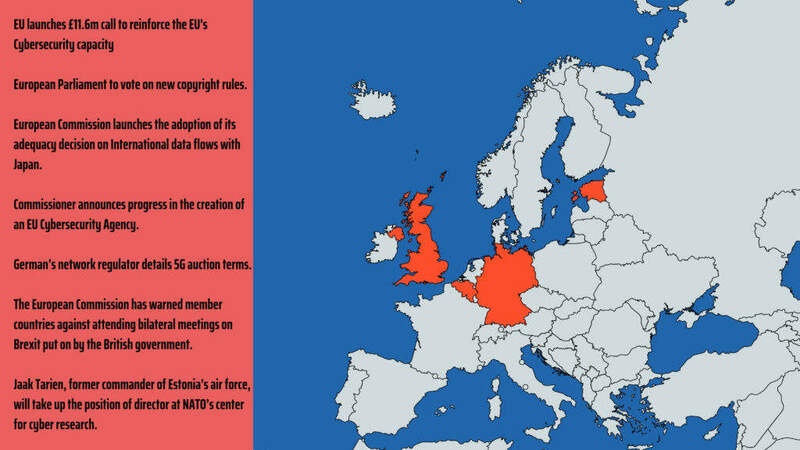 Coming up this week, member of the European Parliament are expected to debate and vote on a controversial copyright regulation for the digital sphere. The map above shows last week’s most relevant digital news. The European Commission has issued a call for proposals under the Connecting Europe Facility (CEF) to reinforce the EU’s cybersecurity capacity, with up to £11.6m (€13m) available in grant funding. The call aims to allow member states to limit the economic and political externalities of cyber incidents, while reducing the overall costs of cyber security. The CEF Telecom funding’s role is to support projects that contribute to increasing the interoperability, connectivity and deployment of trans-European digital infrastructures across the EU, contributing to the development of a Digital Single Market. Applications close on November 22. European Parliament to vote on new copyright rules. Members of the European Parliament (MEPs) will debate and vote on a controversial copyright regulation for the digital sphere on Wednesday. The new regulation’s key goals are protecting press publications, reducing the “value gap” between the profits made by internet platforms and content creators, encouraging “collaboration” between these two groups, and creating copyright exceptions for text and data mining. Some critics believe this could mean that social media and content sites would have to check every piece of content uploaded, a task that would probably need to be performed by an Artificial Intelligence (AI) solution. Indeed, companies might be required to put in place automated copyright checking systems to monitor and report copyright infringements. For example, copyright owners on YouTube currently use a system called Content ID to identify and manage their content on the platform. Videos uploaded to YouTube are scanned against a database of files that have been submitted by content owners. Speaking at an event hosted by the Politico website in Westminster in July, culture secretary Matt Hancock expressed his support for the new EU copyright proposal. If the European Parliament and Council adopt the draft text in September, individual governments will be required to act to implement the directive in their national laws. In the case of the UK, it would only become law if it comes into force before Brexit exit day: 29 March 2019. Following the conclusion of the EU-Japan talks on personal data protection in July, where both parties agreed to recognise each other’s data protection systems as ‘equivalent’, the European Commission has launched this week a procedure for the adoption of its adequacy decision. Each side is now going through its internal procedures towards the final adoption of its reciprocal adequacy finding. This mutual adequacy arrangement is expected to create the “world’s largest area of safe transfers of data based on a high level of protection for personal data”. This includes the additional safeguards that Japan has agreed to apply to EU personal data transferred to Japan, as well as commitments regarding access to personal data by Japanese public authorities for law enforcement and national security purposes, guaranteeing that Japan’s level of data protection is equivalent to that of the EU. Commissioner announces progress in the creation of an EU Cybersecurity Agency. Julian King, European Commissioner for the Security Union, has outlined the Commission’s plans to develop an EU Cybersecurity Agency at the EU’s Cyber Emergency Response Team (CERT) conference in Brussels. “The Agency will also be responsible for establishing and running an EU-wide cybersecurity standards and certification framework to ensure that products and services meet the highest standards of cybersecurity. Negotiations on the Cybersecurity act are well advanced and I am hopeful that they will bear fruit in the near future”, King added. European Commission vice-president and EU digital chief Andrus Ansip announced last year his plans to set up a new cybersecurity centre to improve the competitiveness of European technological products on a global scale. Following the announcement, ENISA asked to expand its mandate in enhancing European cybersecurity, including provisions to increase the level of cooperation between civil and military cyber authorities to contrast trans-national cybersecurity breaches. During the recent CERT conference industry experts and policy-makers shared their insights into the latest developments in cloud computing, hunting, big data and the future of IT security. Sessions on Top Threat Actors, CTI and DMARC were also scheduled. German’s network regulator details 5G auction terms. The country’s network agency Bundesnetzagentur (BNetzA) outlined in a document the details of the auction for the 5G spectrum licences planned for early 2019. According to the document, seen and reported by Reuters, operators will not be required to cover all of German territory nor to allow national roaming when they roll-out 5G services. The document also shows the intention of the government to supply at least 98 percent of German households with a high-speed connection of 100 megabits per second by the end of 2022. The three existing major operators in the country: Deutsche Telekom, Vodafone and Telefonica Deutschland – have already said in the past that supplying all of Germany would be difficult to achieve. Reuters also reported that Germany’s antitrust regulator last week called for a fourth mobile operator to join the 5G auction, rebutting the argument made from the other three bidders that more competition would hit investment. The proposed terms will be discussed by BNetzA’s advisory board on 24 September. The European Commission has warned member countries against attending bilateral meetings on Brexit put on by the British government. In a speech on a date of the release of the UK government papers outlining preparations for a no-deal scenario last month, the British Brexit Secretary Dominic Raab said that in the event of a breakdown of the talks with the EU, he was planning a series of deals with member states to mitigate the impact on both parties. At a meeting of EU27 Brexit officials last Friday, reported by Politico, EU officials and diplomats said they were advised not to engage in bilateral talks with the UK. It was reported that the Commission is concerned that bilateral talks could derail that ‘block negotiating strategy’ and allow British negotiators to gain an advantage through a divide-and-conquer approach. “It seems like a British attempt to sideline the Commission,” one EU27 diplomat said to Politico. The announcement comes at a crucial time in the talks, with less than seven weeks until the deadline for reaching an agreement. Meanwhile, in a committee hearing in Westminster on Wednesday, Labour MP Stephen Kinnock, who was present at the cross-party committee met the EU’s chief Brexit negotiator in Brussels Monday, reported that Michel Barnier had said in French about the Theresa May’s Chequers proposal “les propositions sont mortes (the proposals are dead).” The EU press office has not yet confirmed the news, and a spokesperson for the EU committee said it would be releasing a transcript of the meeting shortly. Cybertech Europe (Rome 26-27 September). The Cybertech Europe conference aims to present commercial problem solving strategies and solutions for the global cyber threat that meet the diverse challenges for a wide range of sectors: finance transportation, utilities, defence, R&D, manufacturing, telecommunications, health and government. Speakers include: Olivier Onidi, deputy director-general for security – European Commission DG Migration and Home Affairs; Alessandro Profumo, chief executive of defence firm Leonardo; and Eugene Kaspersky, chief executive of security firm, Kaspersky. European Week of Regions and Cities (Brussels, 8-13 October). The European Week of Regions and Cities is an annual four-day event during which cities and regions showcase their capacity to create growth and jobs, implement European Union cohesion policy, and prove the importance of the local and regional level for good European governance. During the third day of the event (October 10), the ISAÂ² Programme, boosting digital public administrations in Europe workshop is expected to take place. The workshop aims to address the main eGovernment and interoperability issues and produce guidelines and training for the digitalisation of public administrations at local and regional level as well as e-tools for networking and boosting administrative capacity for EU funds management. The European Union Agency for Network and Information Security (ENISA) is organising the 4th eHealth Security workshop in cooperation with the Dutch Ministry of Health, Welfare and Sport, on November 14. The event will focus on the aspects related to the implementation of EU Directives for the Healthcare sector across member states, and will highlight practices regarding the identification of operators of essential services, the collection of baseline security measures and incident notification. The workshop will also include sessions dedicated to medical devices as well as to emerging technologies in eHealth security, such as Blockchain. UN Annual Meeting of the Internet Governance Forum (Paris, 12-14 November). The thirteenth Annual Meeting of the Internet Governance Forum (IGF) will be hosted by the French Government at the headquarters of UNESCO in Paris from 12 to 14 November 2018. The IGF is a forum organised by the United Nations for multi-stakeholder dialogue on public policy issues related to key elements of Internet governance issues, such as the Internet’s sustainability, robustness, security, stability and development. Jaak Tarien, former commander of Estonia’s air force, will take up the position of director at NATO’s center for cyber research. Mark O’Neill, one of the original drivers behind the creation of and early years of the Government Digital Service, has said he is moving on from his current post as chief digital officer at the Department for Education. The European Commission, Directorate-General for Communications Networks, Content and Technology (Brussels, Belgium) has issued a £1m tender to “enhance the potential of digital hubs and accelerators across Europe in making them work together, develop common projects and construct a digital community that can increase the European competitiveness”. The aim is to connect all the European digital stakeholders and hubs in order to develop an integration and cooperation plan designed to generate common projects and the creation of European digital accelerators that can use the full potential existing across Europe. Cambridgeshire County Council (UK) has issued a £400k tender for research and development to enable the council to use real time data to address transport and other related challenges. The council said it is looking for a partner to inform its thinking about “how to build a smart city real time data platform for transport and mobility applications”. It was also announced that this research and development exercise will include a variety of specialisms and techniques including predictive techniques, artificial intelligence (AI) and machine learning.